About nine in 10 homeowners who have recently remodeled their kitchens added new appliances, mostly refrigerators and dishwashers. 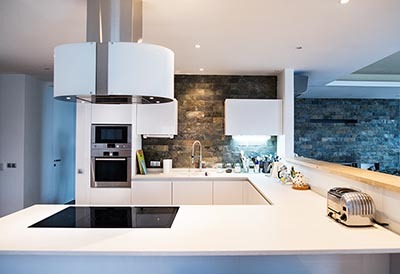 The popularity of wireless-controlled appliances in kitchen-improvement projects has nearly doubled over the past year. Upgrading a kitchen with hardwood floors has been on a declining trend since 2017. More homeowners who have recently tackled a kitchen renovation added high-tech features and appliances, while open floor plans remain a popular reason for upgrading. Those are two key findings from Houzz’s 2019 U.S. Kitchen Trends Survey, which polled owners who have completed a kitchen overhaul within the past 12 months or plan to do so in early 2019. Nearly 90 percent of homeowners who renovated their kitchens replaced outdated appliances, with roughly the same amount adding new refrigerators and dishwashers. The popularity of high-tech appliances has nearly doubled, with 16 percent of homeowners purchasing units that can be controlled wirelessly, compared with 9 percent in the previous year’s survey. Nearly one-third of homeowners added an appliance with at least one high-tech amenity, while 57 percent installed state-of-the-art faucets that include touch-free controls, fingerprint-resistant coatings, or water-efficiency features. Another kitchen-remodeling trend that has shifted is the preference for hardwood floors, with 24 percent of homeowners opting for this material, down from 32 percent in 2017 and 30 percent last year. Instead, remodelers are increasingly opting for “engineered flooring,” as 40 percent of owners are choosing manufactured wood, vinyl, or laminate materials. Similar to Houzz’s 2017 and 2018 kitchen-remodeling reports, roughly half of homeowners who are improving their kitchens did or are doing so to open it up to other rooms. The most popular built-in add-ons are cabinets and islands, cited by about 40 percent of respondents. Also in line with last year’s poll result is the number of homeowners who hired professionals to help renovate their kitchens: 83 percent. General contractors are by far the most in-demand remodeling professionals, hired by exactly half of homeowners. If you’re planning a kitchen overhaul in 2019, there can be definite benefits to doing the work yourself. A November report from NerdWallet found that homeowners who renovate their own kitchens can save $22,000 of the estimated $30,000 that a professional would charge. Additionally, the National Association of Realtors’ recent 2019 Remodeling Impact Report says that homeowners who took a do-it-themselves approach to improvements were slightly happier with the results than those who outsourced the work. But be forewarned that taking home-remodeling projects into your own hands is not a surefire recipe for success. Almost two-thirds of homeowners recently told ImproveNet that they regretted doing at least one improvement job themselves, with installing tile and upgrading counters and cabinets among the most disappointing projects.